In life, we should always say “thank you” to those who help us. Being able to give thanks and be grateful in our everyday lives lead to a much more peaceful existence. We can all take time to watch this reminder on why we need to be thankful for what we have. Humans might not always say “thank you” when a person holds the door open for them. You can’t expect much thanks whenever you say “God bless you” if someone sneezed, but you can count on animals being thankful. One big buck was just relaxing on the side of the street when a woman came up to him, offering him a little snack. 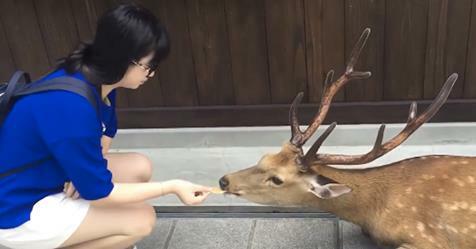 The deer happily munched on the snack, and after she bowed to him, he bowed right back to her to say “thank you!” You can see the adorable exchange in the video below, as she feeds him even more snacks and he bows to her again. If you enjoyed this bowing deer, you will also love this video of a little deer who was stuck out in a lake in Texas getting rescued and then snuggling her rescuer!